The previous two posts1 have looked at the current state of the job market and why applications of artificial intelligence (AI) could make it function better for job seekers and recruiters. They have also mentioned aspects of how AI in this context might work, with the ultimate vision being of intelligent agents (IAs),2 working on behalf of job seekers and recruiters, and able to interact with each other. The beauty of bringing AI more completely into the job market is not just in saving time and facilitating good matches, but the potential to generate new dynamics, from job matches that never would have been found with current methods, to benefits for career planning, staffing strategies, and potentially other areas of the economy. What are the forms that AI (or specifically, the IAs) will take in the job market, and how (quickly) will they will evolve? At this early stage, there are many possibilities, but as some are developed and others not, the process becomes path dependent, meaning that your future options are conditioned by your current direction. Presently, there is attention to developing AI for recruiters and the intermediary job boards, but nothing I am aware of that would work for the job seeker, who is still using basically late 20th century tools to find jobs, write resumes, and apply for positions. The longer that disparity remains, the more it is likely to grow, and we could have a job market where AI works for hiring organizations, employment agencies, and job boards, but for job seekers only through them. This post therefore focuses mainly on how AI for the job seeker might be developed, all within the understanding that the eventual system will involve a distribution of AI tools among all actors in the job market. The “self-driving resume” in the title of this series comes from the notion that a computer program could write a resume, find a job opening, and deliver the resume (and job application) to the hiring agent. 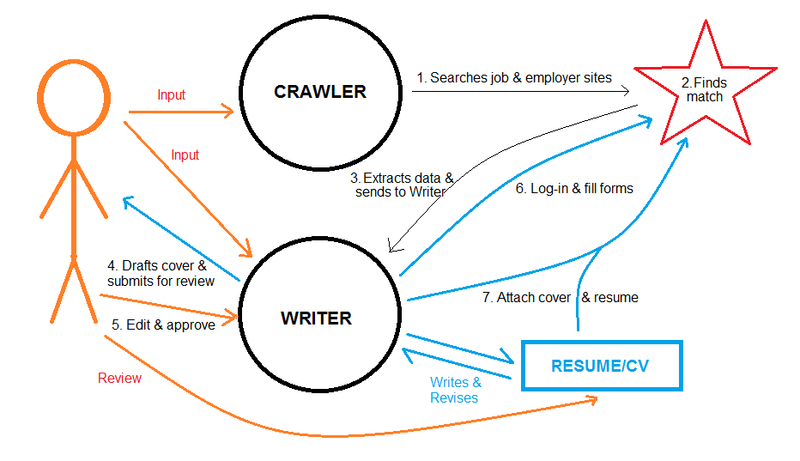 When you get into it, the steps are not so simple, and the technology has not yet been applied in this way[see comment about one example], but the basic idea begins with two proven concepts: a web crawler (incorporating AI advances) and an intelligent program that can author documents (with some human participation, but less than required by the online template-based “resume generator” programs). As the process evolves, and AI can conduct much of the job search and writing tasks unassisted, the self-driving metaphor becomes a bit more apt. With current technology (as I understand it), separate programs would probably be necessary for each of the two main processes – searching and writing. For the first, web crawlers are not new, although there are naturally efforts to make their searches more intelligent. For the second, programs that write human language are much newer, yet have had some interesting successes in specific authoring scenarios (from emails to novellas). For automating a job search, both would be designed as learning programs, and each would probably have to be “pre-learned” about the situations they would encounter (perhaps with AI chips?). In the scenario sketched above (dubbed “Self-driving resume, Mark 0.1”), the crawler (1) searches job sites and organization employment pages according to parameters input by its owner, the job seeker. Those criteria would be types or titles of jobs, particular companies, or perhaps an industry in a region. Basically, the kinds of considerations that an individual searching the web would have in mind when they look for a job are the ones that have to be made clear for the crawler to work on. Assuming the crawler finds a match (2), for example a particular job listing, it would need to find and extract relevant data concerning the job description, qualifications, deadlines, contact names, and relevant details about the organization. In this scenario, the writing program then enters the picture. The crawler would have as part of its function forwarding the data extracted from the job site to the writer in a form the latter can use (3). Perhaps the trickiest part of the scenario is this exchange of information between what are conceived here as two separate though allied processes. The writing program, for its part, would have a number of tasks. It is possible that we might actually be talking about a suite of programs that would function in tandem, with each one specializing on writing different things – though for purposes of this example I’ll assume it’s a single program. One fundamental function of the writer, unconnected with the functioning of the crawler, would be authoring of the resume. The resume will be written by the writer based on input from its owner and then some kind of iterative process of review involving the owner to arrive at a satisfactory product that can be updated by the writer. In this scenario we also assume that the writing program has at its disposal a range of best practices, templates, keywords and other important input devices to use in construction of a quality resume. This resume then is a resource that then can be updated or are tweaked for particular employment opportunities. Another set of responsibilities of the writing program, would be to analyze the data (including text) communicated to it by the crawler which, as described above, has just found a job match, and then to compose a draft cover letter. That cover letter probably would be based on some kind of template that has been pre-loaded, perhaps tweaked earlier by the owner earlier to conform with their style. Its draft letter would then be forwarded to the owner (4) with whatever details on the job it has received from the crawler. The owner then can review that letter, edit it, and as necessary consult the company site him or herself. The finalized letter and approval to go ahead are then returned by the owner to the writing program (5), which then can go to the companies job page, log in for the owner, fill out the forms for the job application(6), and attach the approved cover letter and a copy of the resume (7). The filling out of online forms is a function relating to the writer’s work on the resume and the cover letter, drawing from the same text, to appropriately respond to the usual range of questions that appear on such forms. All of the above assumes there would be no problems with the web crawler scraping the organizations job pages, or with the writer logging in (some sites block one, the other or both). It also assumes that the organization listing the job is not itself already using smart programs. What happens when job seekers and recruiters are working with intelligent automation? From self-driving resume to quantum resume? Moving beyond the rudimentary but still unprecedented Mark 0.1, AI will be enlisted on the part of individual job seekers and each recruiting organization, rather than centrally organized along the lines James Cooke Brown envisaged, or by major intermediary companies. The operant concept is the IA – independent learning programs that will act on behalf of their owners, though what operates for the job seeker and for the recruiter will naturally differ. On one side, the job seeker’s crawling and writing programs discussed above would be united in a single “self-driving” IA – basically an autonomous learning program, able to complete the full range of tasks involved in searching and applying for a position, including preparing application materials, notably the resume, but also capable of scouting out potential positions at organizations in industries of interest (perhaps by monitoring contracts and investments to know which companies might be hiring). Once we have introduced AI into the job search process, it would be a short step to using the IA as a tool to help career planning. An entirely new dimension in this phase would be the potential for interacting with other IAs – of recruiters and companies, obviously, but also with IAs of other people in the job market or just out there in case. Imagine sharing information with other applicants (minus name and personal details) regarding comparative qualifications for a job of interest. Or information on companies – hiring practices, workplace issues, salary levels & offers – from each one’s experience. All of a sudden a range of data becomes available from the IA – a significant benefit beyond automating repetitive tasks and extending searches beyond what is humanly possible. On the other side, as it were, recruiters will also be working with some configuration of IAs (perhaps in a tiered system, partially for security reasons?) to handle job applications, communication with applicants, inquiries outside of job listings, vetting, etc., as well as IAs to seek out potential applicants (more or less reversing the contact and response processes). The idea is not a more sophisticated information dump from one side and more sophisticated management and analysis process on the other, but rather IAs that can query, respond in kind, and exchange information, and that are capable of learning from the interactions in ways that both improve their function and produce and organize usable data for their owners. All that said, it is important to note that the use of IAs would not eliminate person to person contacts, serving instead to get us to where those contacts are most productive, and indeed giving us more time for them rather than repetitive tasks. As IAs of job seekers and recruiters, or job seekers with other job seekers, communicate directly with each other, this will not take take place in human language (if we take recent experiments as an indication of what is to come). The resume will no longer have a fixed form, except when needed for human reading, and then will change according to the context and the IA’s learning from experience – almost a quantum phenomenon. The database of professional information and job history that goes into the resume will originate from the owner, and be tweaked as appropriate, but the specific selection and organization of information transmitted in each circumstance – or generated into a printed document in the appropriate human language – would likely differ. There will no longer be a need for companies to tell you they’ll “keep your resume on file,” since recruiters could page your IA (or the IA of anyone, or theoretically everyone) for resumes when they need them. There will have to be protocols and standards for communication among IAs, including ways to translate their communication to forms we recognize for checking and analysis. One interesting question is what will be the virtual space in which this interaction of IAs takes place? Would this happen simply over the Internet, or on the servers of particular companies or job boards, or some dedicated “agora” run by an intermediary non-profit organization? Setting up an experimental crawler that can find jobs and download (“scrape”) relevant information. The idea would be something that can be easily tasked (what to look for) and tweaked (to improve results). There are crawler programs available, but thinking here of something purpose-designed and friendly to non-expert users – something one could run from a desk-top or perhaps a smart phone. Setting up a program to author resumes based on information given it, perhaps in the form of an existing resume. However, this is an intelligent program, not a fillable template program, so it would be expected to produce a document with minimal input and understand when it needs more for a complete document, and where it can trim information for succinctness (and space limitations). A next step would be to be able to adjust the resume contents in function of input of a job description and requirements. The step after that would be authoring a cover letter in function of the resume material and input of job information. Here too, a priority is user friendliness. Development of a plan for how to link the two programs. The next step on this, as I see it, would be how to unify them into a single IA. I am interested in the possibility of this being approached as an open-source project (though am unfortunately not at the level of being able to contribute to the actual development). A meta-requirement is elaborating the vision of how IAs of job seekers and recruiters would interact. This would be more on the cutting edge of AI development as I understand it. 2. The concept of “intelligent agent” is applied variously, depending on the domain of activity and the specific need. Some useful discussions online (from short to long) illustrate the range: Business Dictionary; Webopedia; TechTarget; Techopedia; Wikipedia; Consortium on Cognitive Science Instruction; and Michael Wooldridge’s chapter on Intelligent Agents in the first edition of Multiagent Systems (now in its second edition). In an article in Fast Company entitled “I Built A Bot To Apply To Thousands Of Jobs At Once–Here’s What I Learned” (23 March 2017), Robert Coombs describes his experiments with a bot that is well beyond the “Mark 0.1” proposed above. So basically the first steps mentioned in this post are already done, with some interesting results. Those results call attention to two areas I did not discuss in this series: networking and unlisted jobs. Networking is mainly thought of as being a person-to-person process, with the help of tools such as online social networks, and this will remain its fundamental nature. However, when intelligent agents (IAs) are eventually developed for use by professionals on the job market, it is possible that they could facilitate networking on a much wider scale (note my mention in the series of job seekers’ AIs interacting with each other for information exchange). @donosborn It'd be tough. It's not a matter of volume or algorithmic power but access to the data. I'm working with folks who are solving that though.